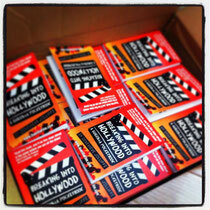 Breaking Into Hollywood: The Guerilla Pocketbooks arrive! After a few weeks longer production time than expected, the new Hollywood Pocketbooks books have finally arrived. Those of you who pre-ordered, THANK YOU, the books will go out today. If you don’t know about this book, it’s our first self published pocketbook in the Guerilla Filmmakers Handbook series – and one of many hyper-targeted pocketbooks we hope (read tiny but mighty). If you want to work in LA, then this guide written by Gen, and based on her ten years experience as a Brit filmmaker and screenwriter in tinsel town will be invaluable.